So here is the deal. I am running BFG KM2's in a 255/85/16 load E and have 23k on them and they have been through all kinds of places here in MT, Wyo, ID and a bunch of Oregon basalt and not a single problem. I thought I had found a tire that compared to my M55's that I used to run till they became way over priced. I was headed down the highway with camper on and boat hooked going fishing the lower Yellowstone so I wasn't hauling or doing anything unusual. w I start getting a vibration and I'm going 70 mph. I think it's a fluke but it progressively gets worse. I pull over thinking maybe I threw a wheel weight or something minor. Well I see that the rear drivers side wheel has delaminated inside and is crowned to beat hell. So I throw my spare on, which is a same size KM2. Off I go smooth as butter. Next day heading home down highway again I get the same vibration back. I'm thinking wtf, this cant be true. pull over and sure enough the passenger side rear tire has done the exact same thing. Delaminated and crowned in the center. I limp it home and call tire guy. He gives me the song and dance about "mud tires" and heat, and rocks, and sticks, and chickens, and goats, blah blah blah. Sorry cant really warranty them but I will cut ya deal on some Hankook Rf10's. Sorry but I am not giving you any of my business again. So after that digression..has anyone had a problem like with their KM'S? I religiously check my psi's and was running 62 psi on all fours. 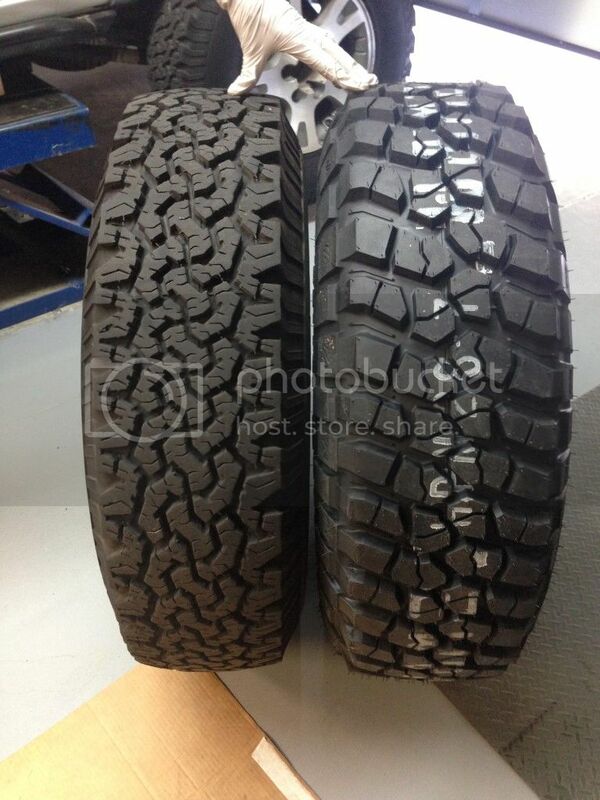 So now I'm tire hunting again and hate to pay Toyo prices. M55's are 310 apiece here. UGH! I had similar problems with BFG KMs on my Excursion after about 25K miles of mixed use (including towing). I now use M55s for all long haul and winter travel. Unfortunately the M55s have traction issues in the mud so I still need to keep a set of KMs. Not sure what kind of vehicle you are running, but I'll assume an HD pickup of some kind. If you had a camper + trailer tongue as a load, shouldn't your rear tires be inflated to 80psi? Tires delaminate due to excess heat. Too much heat is caused by underinflation. EDIT: Ok, back on desktop, so I see you are carrying a fairly lightweight camper on an F350. I still think those tires should have been inflated >70psi, especially during a Montana heat wave at 70 mph. I ran the BFG's at 70 psi when I first got them but they have such a stiff sidewall that it was a bugger on stiffness. Especially on any washboard road. I am lazy about inflate/deflate and have had a good balance with 62. Never have seen any bad tire wear either, till this. Just seems strange both go within a day of each other. It was 6am and cool when the first one went. Second tire went at maybe 75 degrees outside temp. Camper weight was packed really light as it was a two day trip. Boat tongue weight is maybe 150 lbs at max. I've seen Dodge diesel trucks here eat KM2's up in 22K in the wider sizes. The tread compound seems really soft. The shop I use sees every brand tire come in. The Toyo MT in their experience continues to be the toughest one out there. Too bad they don't offer that size. I loved the 285-75-16 M-55's on my 2nd gen.
Heat is what causes failures like this generally, so I think you just cooked 'em, and that's how you got two failures in a row. If you like the tires for everything else, just muster up a little ambition and adjust the pressure in the rears up a little for camper carrying longer trips. This is where rear axle CTIS would come in handy... I really need to get to developing it!! I think my km2's are louder that the km's I had before them, and they rattle like hell. They also have a minor cuts on them while the km's were spotless after 50,000km, driving on the same rocky mountain trails I always do. I will go with Toyo next time. Never heard a bad thing about Toyo. Never. Except when it comes to the price, but bf's are also expensive. I just ordered my first set of KM2s ever after hearing nothing but great things about them over the years...and now seeing this thread is deflating. Hopefully mine will do better being on a lighter truck. The AT KOs are awesome tires and I've never had any problems with them so the only reason I 'stepped up' to the KM2s was because I didn't want to think twice about the durability or toughness of my tires when scrapping up against sharp rocks in the mountains. I dont think km2 are bad tires. They have very great traction and feel comfy on rocky roads. I was just disappointed when I saw cuts in the sidewalls. I just think the km's are a better tire. But, 70% of my driving is on paved roads, so I should be driving AT's with superstrong sidewalls. That is why Toyo m55 might be the tire me. I had the identical problem, with the identical size. I lost 2 of them within 2 months of each other, both rears, running 70psi with the camper, 55 empty. I did have a couple hundred miles of slow rough roads @ ~45psi in there - but nothing crazy. Overall tread life isn't anything to write home about - but at least the tread lugs haven't shredded & ripped off like their older tires always seemed to. I doubt I'll put another set of BFGs on mine. FWIW, Discount Tire did warranty both of mine without question. $310 a tire isn't that much if they last longer than 22k and don't blow out on a trip. My gripe with my present KM2s is having been gypped a half inch on their size (35x12.50 should be advertised as a 34.5x12.50 if they aren't going to make it a full 35" like Goodyear, Toyo, and some others do). Tread life on the other hand has been outstanding (33K miles on my previous KM(1)s and they were easily 50% tread left (but did get chunked & shredded pretty bad by rocks)... my KM2s have almost 2K and the little injection nubs on the tread are still quite visible... A set of MT/R-Ks I had were 30% gone after 12K miles). I would agree the KM2s are somewhat louder than the KMs were. Overloading any tire will cause overheating and separation between the tread and carcass, this isn't a tire issue, it is an application issue. What does your camper, contents, and tongue weight of your trailer add up to? Most people severely underestimate the loads they place in their vehicles and on their tires. It's not their fault really, our vehicles have incredible capabilities, we just tend to overestimate them at times. My new set just arrived to replace my almost new KOs, which replaced the almost new Duratracs BTW I love the KOs, awesome AT tires. 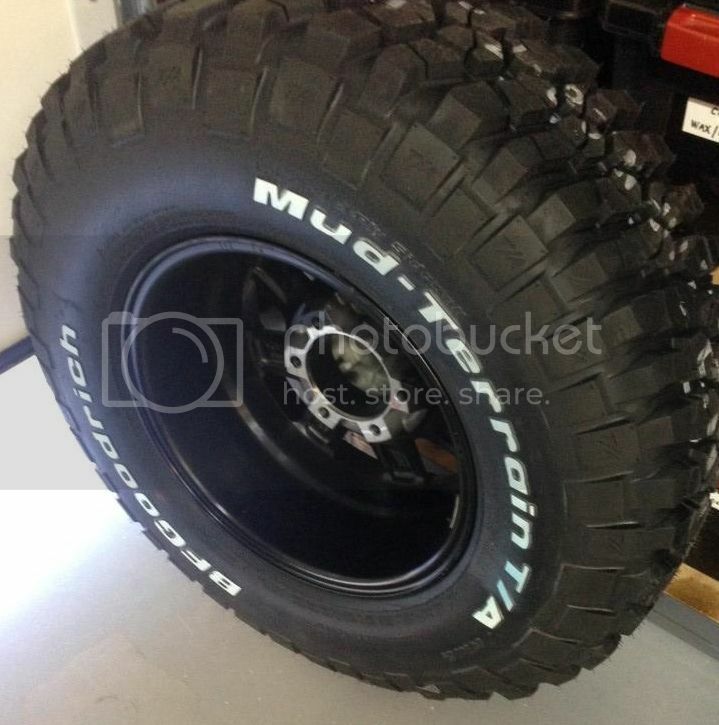 I just wanted the tougher look of the mud tires...hope they serve me well because they sure aren't cheap.